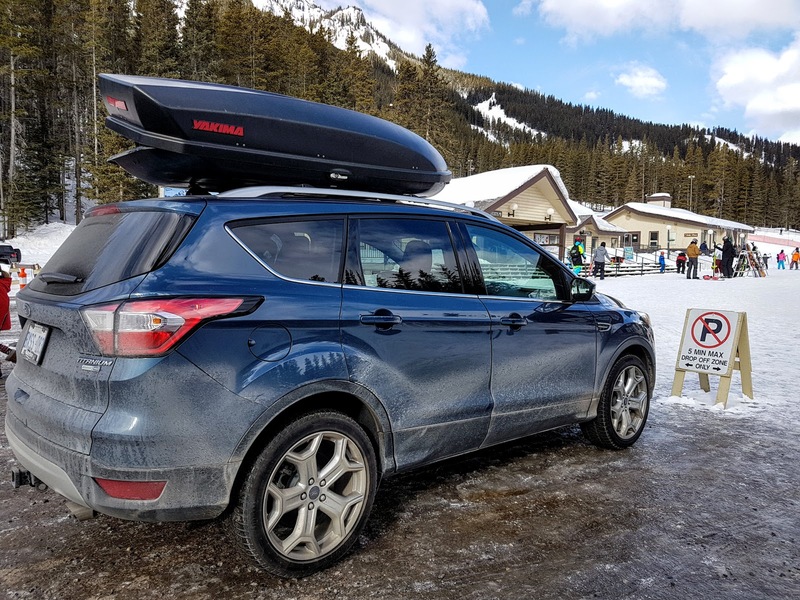 On our quest to find a new #playoutsideride, we took the 2018 Ford Escape Titanium for a multi-day road trip test drive. Here's our review of the 2018 Ford Escape Titanium 4WD. The 2018 Ford Escape Titanium is an attractive, compact SUV with a peppy 2.0 L / 245 horsepower engine, the latest connectivity and safety systems, and thoughtful features that make it a pleasure to drive. 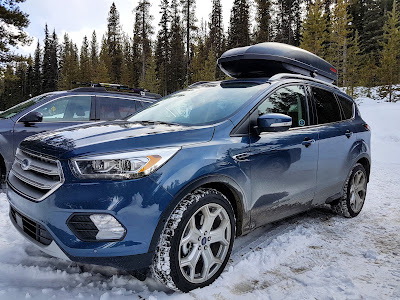 From the heated steering wheel that warms up in seconds, to adaptive cruise control that automatically slows down when traffic in front of you slows down (then resumes speed automatically when safe to do so), we were really impressed with the Ford Escape. Note: "Titanium 4WD" is the top trim for the Ford Escape. Six other trims are available. 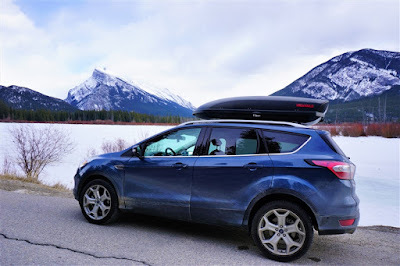 We put 1,000 km on the Ford Escape Titanium - 80 % highway / 20% city - over 8 days and tested most of the vehicle's features. A lot of our driving was in the mountains so we could see how well the vehicle did on steep hills and tight turns. Winding roads and icy parking lots were no match for the 2018 Ford Escape! The Ford Escape Titanium has several features I've never used before, so Eric, the Fleet Manager gives me an overview before I leave the dealership. Thankfully the touch screen is pretty intuitive, connecting my phone is a breeze, and the safety features kick in automatically, so it only takes a few minutes to get set up and move on to the fun part: driving! Select the lane-keeping alert to be notified with vibration in the steering wheel when your vehicle starts to drift towards the edge of the lane (lane-keeping guide keeps you in your lane but isn't ideal for snow-covered roads or roads where the lines are faint). Choose the largest gap between cars when setting up the adaptive cruise control, so the vehicle has plenty of time to stop if the vehicle in front of you suddenly slows down or stops. After finding some tunes and turning on the heated steering wheel (my favorite thing on a cold day! ), it's time to hit the road. The first thing I notice is the Escape's power! I have to ease up on the gas so I don't get a speeding ticket right off the bat! According to caranddriver.com, the Ford Escape Titanium can go from 0-60 mph (96.6 km/hr) in 7.1 seconds making it one of the fastest SUVs in its class. The engine cuts out at the first stop light; freaking me out a bit even though I'd been told to expect it. In order to balance power with fuel efficiency, the Ford Escape 2.0 L Twin Scroll EcoBoost® engine automatically stops when you come to a full stop and starts back up again when you take your foot off the brake (Auto Start-Stop Technology). After a couple more lights, I get used to it and enjoy the peace and quiet. I wish more cars had this feature to reduce emissions while idling - especially in the school traffic circle! Back at home, it's time to pack for our ski trip. 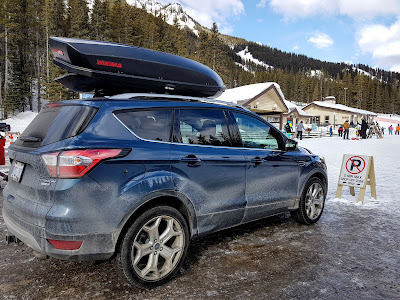 Since the Escape is about the same size as our Honda CRV, we put stuff where we usually do: luggage, outer wear, and food in the trunk; skis, poles, and boots in the roofbox. The large center console, however, means my purse - which normally goes on the floor between the seats - has to go at my hubby's feet on the passenger side. Is this the universe's way of saying I need a smaller purse? My kids "help" pack by opening the trunk with a kick of the foot then asking us to close the trunk so they can open it over and over again. The hands-free lift-activated liftgate works when you have the Intelligent Access key in your pocket/purse. This feature suits my grocery shopping style to a tee - where I don't have a loonie for a cart and end up with seven bags of groceries in my hands wondering where my keys are. Ever had that experience? The keyless entry and push button start are two more of my favorite features because my keys are usually clipped in my backpack or buried in my purse. As long as my key is nearby, we can get in and go. It seems like such a little thing, but keyless entry is one of the features we've missed most since returning our loaner car. The Ford Escape Titanium boasts a 245 horsepower 2.0 L Twin Scroll EcoBoost® engine. This turbocharged 4-cylinder engine with 6 speed automatic transmission provides quick acceleration and the capacity to tow 3,500 pounds; more than most vehicles in its class. It's fun to drive and awesome passing power means we're never stuck behind a slow moving vehicle for long. As we leave city limits, I set the adaptive cruise control and let the car do its thing (with my foot hovering over the brake just in case). Shortly, we approach an RV struggling up a hill and the Escape slows down automatically keeping a nice gap between us and the RV. When the coast is clear, I pop into the fast lane and the Escape quickly resumes cruising speed. Although I always shoulder check before changing lanes, my husband (who likes to backseat... er passenger seat drive) takes comfort in the Blind Spot Information System (BLIS®) which lets you know if there's someone in your blind spot on the left or right with a yellow indicator light on the respective mirror. He asks what other safety features there are, and I tell him, "You don't want to know," because I have no intention of testing out the Forward Collision Warning System. We leave the prairies and foothills behind and enter the Rockies. Twisty mountain roads pose no challenge to the Ford Escape. It handles beautifully and grips the curves well. Over the next few days, we drive down many winding mountain roads - some snowy, some icy - with no issues at all. SiriusXM reception in the mountains is excellent! We only experienced a few 1-2 second outages in mountainous areas with lots of trees. 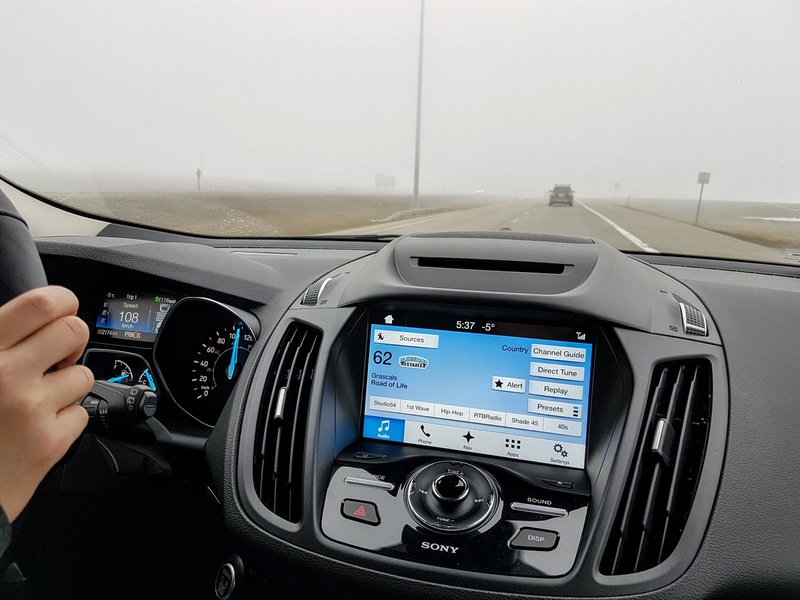 I am told that the Ford Escape Titanium comes with a free 6-month subscription to SiriusXM Radio and SiriusXM Traffic and Travel Link(traffic, weather conditions, and more). 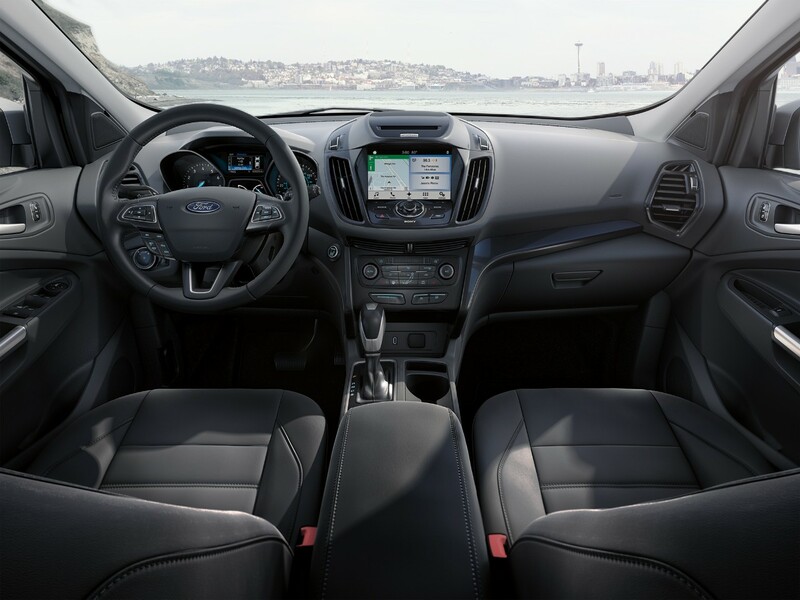 Ford's user-friendly SYNC3® infotainment centre controls it all with an 8-inch touchscreen, voice-recognition, and hands-free calling (once your phone has been synced). We liked being able to pinch and zoom on maps just like we would on a phone, tablet, or laptop. You can also track, remotely start, and unlock/lock your vehicle with standard SYNC® Connect and the FordPass® app! Parking Assist - helps you find a parking spot and parallel / perpendicular park. Since I know someone who had an accident with parking assist (her fault, she didn't hit the brake), I was leery to use it. We did, however, make use of the the reverse sensing system and cross traffic alert when backing out of a parking stall and found it quite helpful since my back window was blocked by luggage. Valet Mode - keeps information private. Use this when you take your car to the shop! 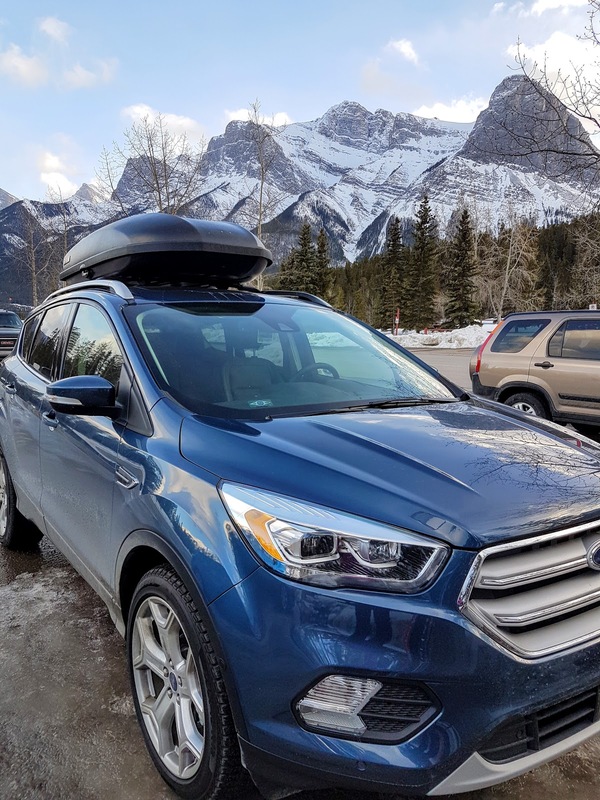 The safety systems' sensors work great in fair weather when clean, but can be affected by snow, ice, mud, or heavy fog, so you should still shoulder check and be prepared to brake when necessary. We drove in light snow and moderate fog with no issues. but I kept my foot hovering over the brake just in case. 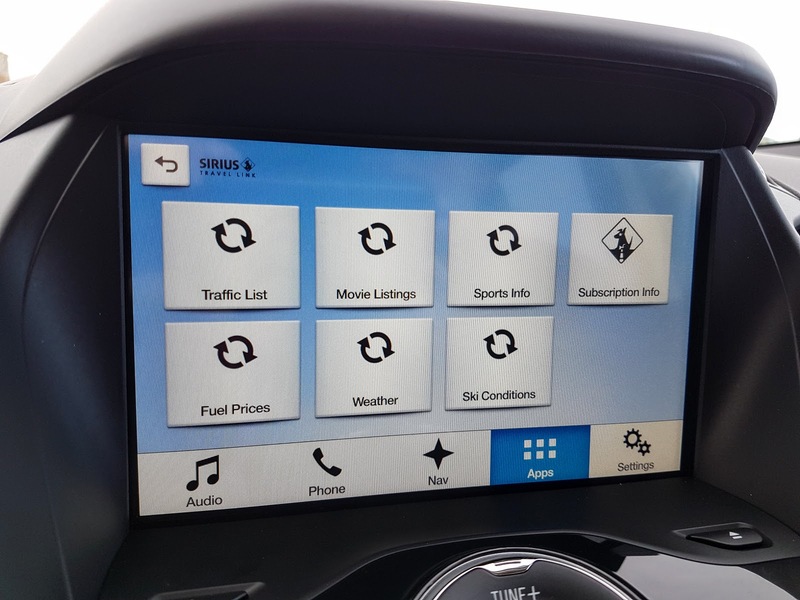 With all the Ford Escape's thoughtful features, it was pretty hard for me to find anything to complain about. 1. Gas mileage: Despite the eco friendly features like auto-on/off when stopped, the fuel efficiency wasn't as great as we hoped for a vehicle in this class. While the 2.0L EcoBoost engine makes driving a lot of fun, when you factor in the extra gas it needs, plus the fact that premium fuel is recommended, driving the Titanium gets a bit more expensive. If I were to purchase a Ford Escape, I would consider the Ford Escape SE or SEL for better fuel economy (10.2 L/100 km city / 7.8 L/100 km hwy). Both models have the 1.5L 179 horsepower EcoBoost Engine and take regular fuel. 2. No USB ports in back seat. There are two USB ports in the front and none in the back, but you could plug in a standard wall charger with multiple ports into the 110V outlet in the back (available in Titanium trim only). 3. The dealbreaker: Not enough cargo space for 4-person multi-sport roadtrips. 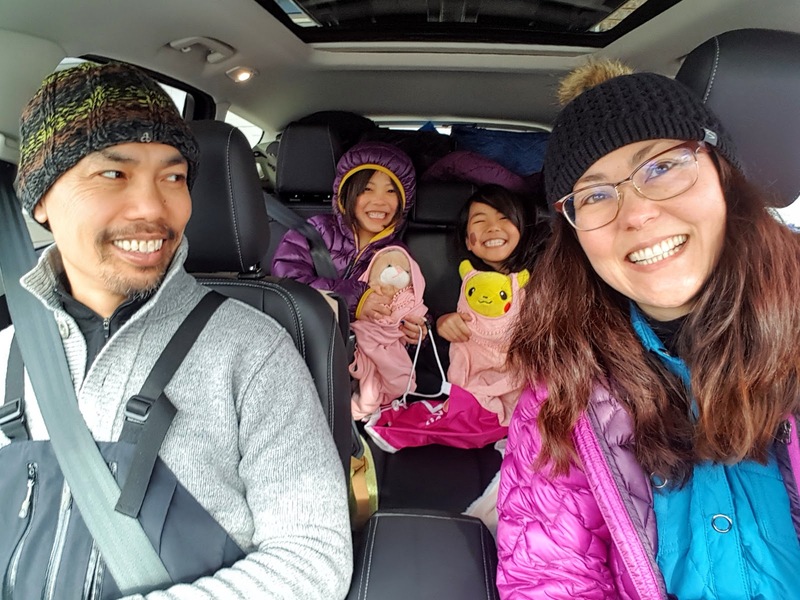 The Ford Escape actually has pretty good cargo capacity for its class, but doesn't have enough space for multi-sport family roadtrips. Even with a large roofbox for ski gear, the trunk was full to the ceiling. This is the same problem we have with our Honda CRV which is similar in size to the Ford Escape. The large centre console takes away some space too (you can fit lots of small things in it, but no big stuff like a midsized purse). Standard options: 2.0 L Twin Scroll EcoBoost® engine with auto start-stop, Intelligent Access with push button start, reverse sensing system, navigation, self-parking technology, HID headlights, curve control, Sync® 3 infotainment system: navigation, AppLink, handsfree calling, SiriusXM Radio and more. Intelligent Four Wheel Drive: four wheel drive is activated as needed. Sport Appearance Package: 19-inch premium black painted aluminum wheels, halogen projector headlights with black bezels, LED signature lighting, black-tinted taillamps, unique black front fender grilles, gloss black painted upper grille with chrome inserts and surround, gloss black front and rear lower fascia, black roof rails and sporty V-shaped partial leather-trimmed seats. We loved driving the 2018 Ford Escape Titanium and recommend it to couples or 3-person families who are looking for a powerful, yet compact SUV with awesome safety and connectivity features. It's just a little too small for our four-person, multi-sport roadtrips, so we're going to check out the Ford Explorer (midsized SUV) next. The 2018 Ford Escape Titanium starts at $36,299 and offers good bang for your buck. If you'd like all the available options listed above, however, you're looking at closer to $44,000 before tax. I recommend test driving the Titanium and SEL to see what the difference is as the SEL has most of the features we loved in the Titanium, but the base price is $7,100 less. Bonus: the SEL takes regular fuel instead of premium! 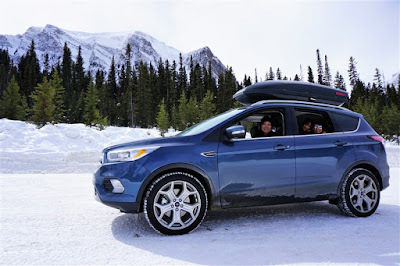 For more information on the Ford Escape Titanium including complete specs and pricing, please visit Ford Canada. Ford Canada generously loaned us the 2018 Ford Escape Titanium to test and review. All words and opinions are my own. Good review. It's the cargo space and fuel economy I'm most interested in. We love our 2010 RAV4 but when we replace our other car, this is the type of info from a multi-sport adventure family that I want to know. 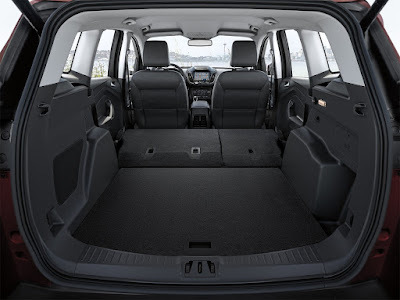 The cargo space is quite similar to our 2008 Honda CRV (and probably the Toyota RAV4) so if you're outgrowing your RAV4, you'll likely want the next size SUV. ;) In some ways, you need less stuff as the kids grow (no booster seats, potty) but their gear gets bigger (bikes especially)! 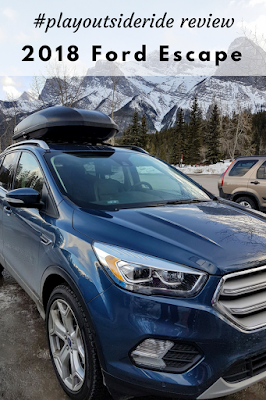 Fuel efficiency was about 10 L/100 km - pretty similar to our current vehicle, but the Ford Escape's turbocharged engine has WAY more power. But if you get the 1.5L EcoBoost (vs 2.0L) the fuel efficiency is far better. I loved having passing power for a change and not being stuck behind slow moving vehicles on single lane highways (a problem with our current car) so we're gonna look for the best balance of fuel efficiency and power.. need to research variable cylinder management more since we do a lot of hwy driving. What vehicles are you considering?